Honeygrow is not your average fast casual joint, as from the start the process is a little different than other restaurants. Orders are placed by customers on computers, so that they can customize their meal as much or as little as they please. I for one liked this freedom, but at times there was almost too much freedom to make a decision! 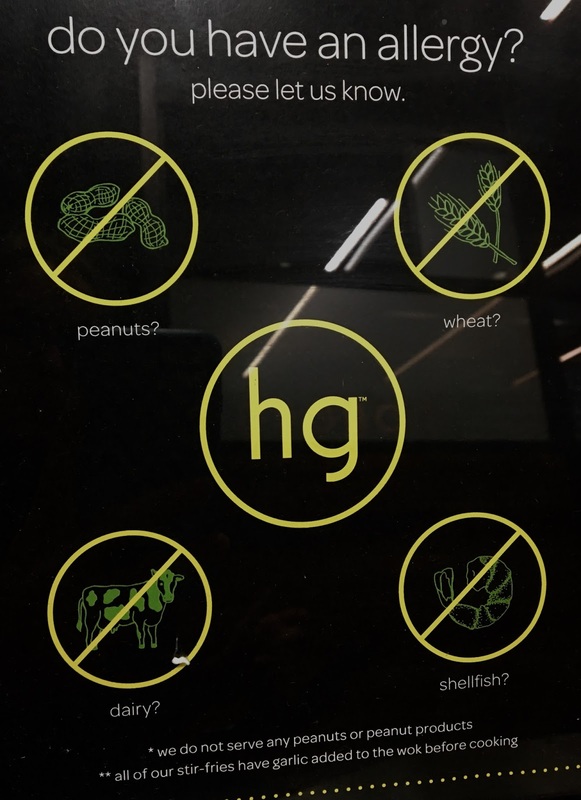 Honeygrow is knowledgable about food allergies, as much of the menu (but not all) is labeled to identify gluten-free and vegan options. Once ordering on the computer, customers inform one of the workers of their allergy so that the workers can change gloves and use fresh utensils and pots to prepare the allergy order. The process from ordering to informing the staff went smoothly for me, and I liked how the staff double checked my order to make sure it was good to go. When build-your-own stir fries are on the menu, of course that's what I had to order. 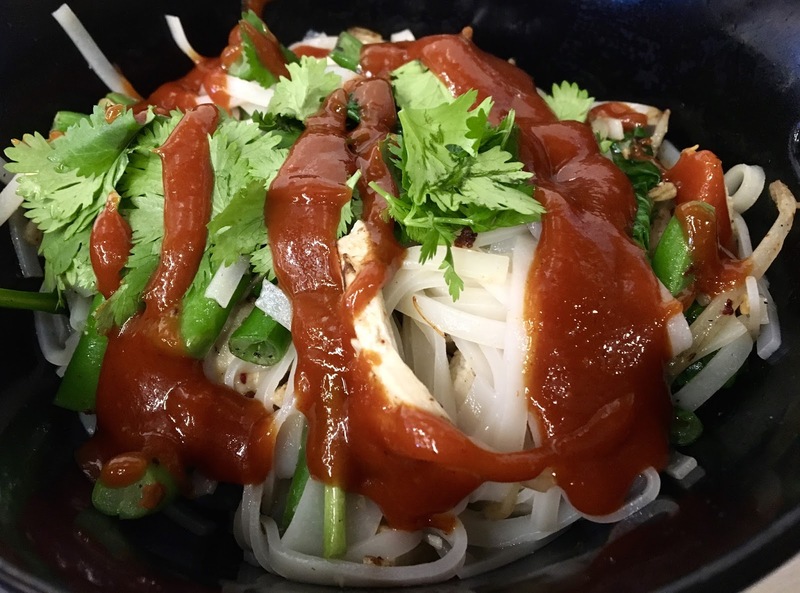 I build mine using rice noodles, chicken, green beans, bean sprouts, spinach, cilantro as a garnish, and a topped with chili sauce (I ordered it on the side so that I could control how much flavor I wanted). 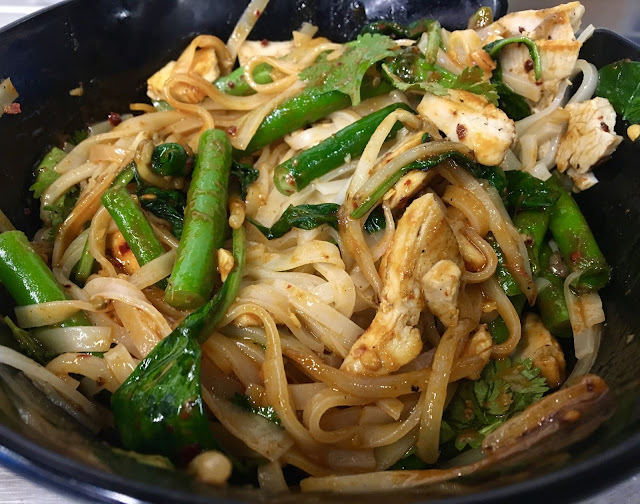 The stir fry was incredible, with each component in perfect proportion and cooked to a perfect temperature. The vegetables were fresh and the chicken was tender. I loved the sweet and spicy vibes of the sauce, which made the whole meal one big bowl of comfort food especially since I was battling a head cold that day. The portion is large, but I eagerly ate every bit. It's exactly the kind of comfort food us gluten-free folks have been missing out on (since most Asian places are not safe), and I love how Honeygrow easily accommodates allergens. 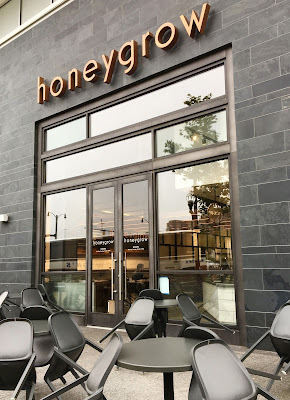 For dessert, I also tried their signature honeybar. Also a design-your-own concept, diners choose their favorite fruits, honeys (or maple syrup for vegans), and toppings for a sweet finale to the meal. 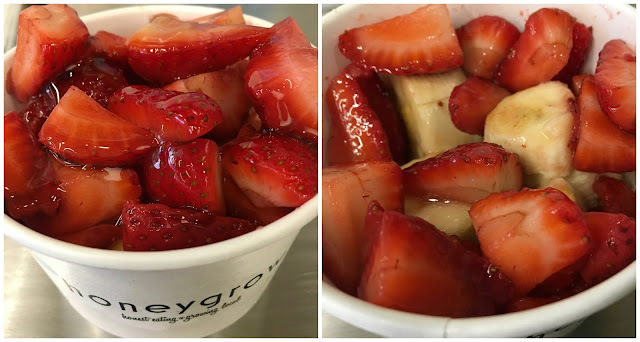 Unfortunately, most toppings were not both gluten and dairy free (whipped cream, granola, yogurt), so I stuck with fruit (bananas and strawberries) and honey (a wildflower variety). The allotment of honey was just enough to provide a flowery complexity to the fruit but at the same time not make a sugary sweet dessert. Although I wouldn't order it every time (as the flavors can contrast with the savory stir fry), it is a novel concept for dessert (which food-restricted folks don't always have options for). My only complaint? Add more gluten-free and dairy-free toppings options (or source toppings that are naturally safe). Although I have been to quite a few fast-casual restaurants in recent weeks, Honeygrow is a cut above in my book for their allergen expertise and delicious fare. As someone who can be picky, I enjoyed designing my custom meals. The price point was fair (less than $15 for both items), and the food equally good for in-house dining or take out. 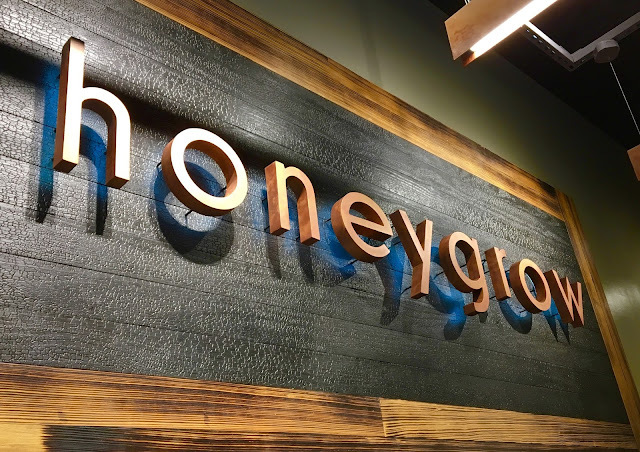 I definitely will be frequenting the Honeygrow location(s) closer to me in Baltimore, and look forward to incorporating many more story fries and honeybars into my life. Update 1/19/17: Since my first visit, Honegrow locations have popped up in Baltimore (Charles Village and Harbor East) and D.C. (Chinatown). I frequent the Baltimore locations at least once every other week, and found them consistently competent with allergy orders. 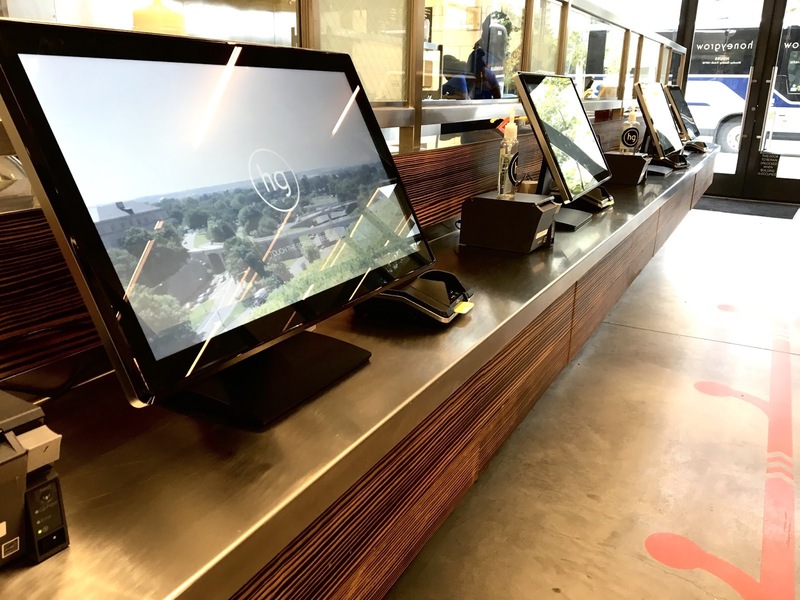 As of this update there's still no way to indicate allergies at the ordering station, but the staff are helpful once you notify them of your needs. Update 5/30/17: On a return visit, I decided to venture away from the stir fries and check out their salad options. I opted for one of their suggested blends- the cobb- which is naturally gluten-free. The salad normally comes with blue cheese, so I removed that, and due to preferences, I opted to also remove the bacon. The salad was generously portioned, served in a chilled bowl. The vegetables were fresh, accentuated by a sharp vinaigrette. Apples provide notes of sweetness, and boiled egg and turkey provide protein. 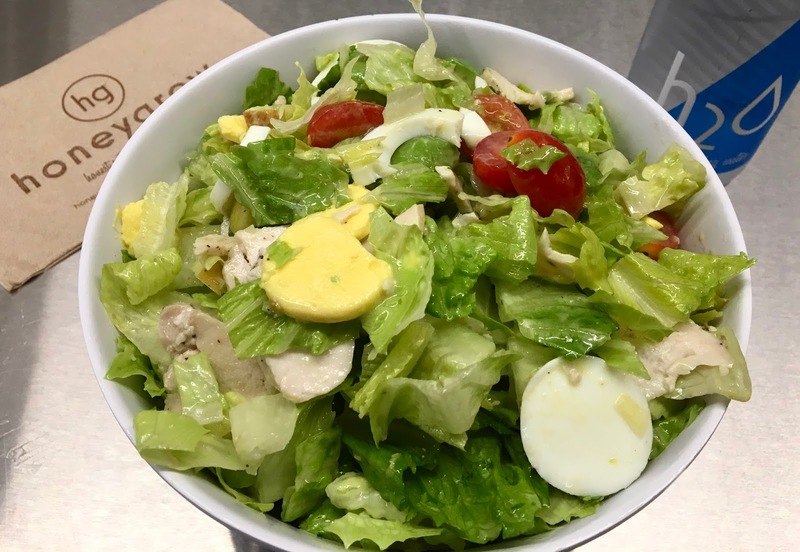 I really enjoyed this salad- it has the high quality I've come to expect from Honeygrow's food.